Carlsbad Caverns is gargantuan – so far about 50 kilometers (30 miles) of its 118 caves have been explored. An estimated 500 kilometers (300 miles) have yet to see man or light. Carlsbad Caverns is in the middle of nowhere in a desert-mountain region of New Mexico in the southwestern USA, yet it draws visitors from around the world. The colossal stalactites, stalagmites and other limestone formations are buried deeper in the earth than the Eiffel Tower is high. You can take a self-guided or ranger-led tour down safe and easy subterranean sightseeing trails. Prefer not to walk a thousand feet down into the Carlsbad Caverns innards? You can board a quick-descending elevator. Whatever you do, bring a jacket or sweater - the cave temperature is a cool 13C (56F) throughout the year. The deep down Big Room is the most popular attraction of Carlsbad Caverns. Its ceiling is as high as a 20-story building and the floor area is larger than a dozen football fields. Strategically positioned hidden flood lights give this chamber an eerie, other world appearance. Visitors who stay until dusk at Carlsbad Caverns enjoy an awesome treat. They get to see hundreds of thousands of nocturnal bats swarming out of the cave openings to feed on insects. This stunning sight occurs only during warm weather months (the bats winter in Mexico). 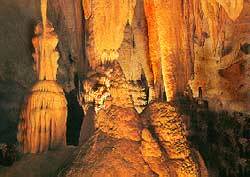 Most of the world's famous limestone caves in the world were carved primarily by underground running water. Not so with Carlsbad Caverns. Sulfuric acid did most of the work.